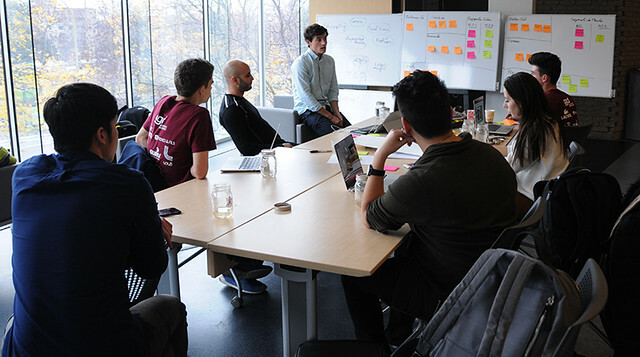 A number of HEC Montréal students and alumni shone at the latest Startup Weekend, fashion edition, held at the School from November 11 to 13. Participants had 54 hours to create a viable business project that was evaluated by a jury of industry professionals. 1st place went to the Majupe.com team of Mathieu Antoine (MSc, 2015), Gabriela Sinclair Desgagné (BBA, 2015), Anais Vroland and Mathieu Phaneuf. The Cocoon project team, which took 2nd place, was made up of Sokhna Diaw, Julia Demon, Felix Antoine Lasnier (all BBA students), along with Emy Vo and Gabriel Coté. The Public Favourite prize went to the Charlie team, of Marie Gallois, Baptiste Dubois, Clara Pochard and Tiphaine Leger (all BBA students), along with Louis Pitois and Damien Goehring. Genevière Rousseau heartily agrees. She is the founder of BonApp, aimed at reducing personal food waste. Her project was just at the idea stage when she presented it at the March 2015 edition, where it was chosen by jury member LP Maurice as his favourite. This fall, BonApp installed five refrigerators in cafés across the city where Montrealers can leave unwanted food.